"How do you know where you are?" asks Leonard Mlodinow in his charmingmathematical history, Euclid's Window. This question and othersabout space and time grew out of simple observations of the environment bya select group of thinkers whose lives and brains Mlodinow dissects.Starting with Euclid, geometry has flowed out over the centuries,describing the universe, and, Mlodinow argues, making modern civilizationpossible. This is not just a history of geometry--it's a timeline of reason andabstraction, with all the major players present: Euclid, Descartes, Gauss,Einstein, and Witten, each represented by a minibiography. Lots of examples pepper the narrative to help readers achieve their own"eureka!" And it's impossible not to be staggered at the mathematical featsof these geniuses, accomplished as many of them were in the absence ofanything but observation and intense thought. Each story buildssatisfactorily on the last, until at the end of this delightful book, onehas a sense of having climbed a peak of understanding. I was given this book as a gift, and after having it sit on my shelf for a long time, I finally read it. Or at least most of it (I'll explain later). As with most pleasure books that are ostensibly about math, this one is really a combination of math, physics, history and a touch of philosophy. Although the title implies that it's about geometry, the book actually discusses a broad range of topics from ancient Greek philosophers, astronomy, Des Cartes and his coordinate system, Maxwell's equations, Einstein and his theories of relativity, and string theory to name only a few. One of the things I like about this book is that it actually discusses concepts in non-Euclidean and how they apply to real life (e.g. cartography). Non-Euclidean geometry is something that seems to be very seldom discussed in laymen circles. Unfortunately, this book didn't discuss it enough. And other than this one topic, the book doesn't have anything really unique to discuss. That's not to say the read was boring, but why write about topics other authors have extensively discussed already? Some last comments: the writing style is good (you'll probably laugh at least a couple times). There are a few egregious typos. And why did I rate this book 4 stars instead of 5? Because it spends the last few pages discussing string theory. I personally think string theory is garbage, hence I didn't bother to read that part. 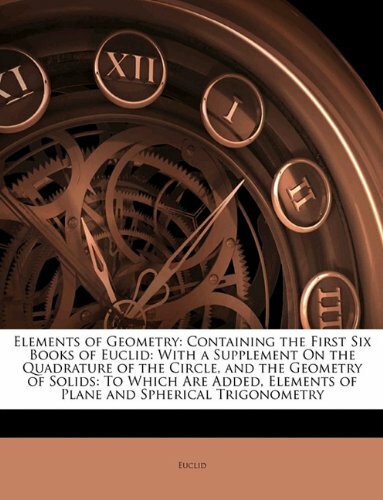 "Euclid's Window" traces the roots of particle physics, from the initial geometric work of the ancient Greeks, to Descartes attaching algebra to geometry, to Gauss and Riemann realizing that space need not be flat, to Einstein applying these ideas in the theories of relativity, to the particle physics and string theory as we know it today. These are just a few of the mathematicians and scientists discussed. The book is not a history of geometry as the subtitle suggests, as Mlodinow only takes the parts that are relevant to the current physics-based explanation of the world (membrane theory) and the quest for a grand unified theory and how geometry fits into it. The story along the way is very engaging and entertaining, revealing both the life and times of the people that invented the various theories we use today, as well as lucidly explaining the theories themselves (even string theory). I highly recommend the book for both entertainment value and educational value, though I must qualify this statement: Mlodinow makes a few blunders along the way with dates, fills in some details with his own imagination, and interjects his opinion quite frequently. You might walk away from the book thinking that Ed Witten is the next Einstein (not to discredit Professor Witten, as he has made very important contributions). Mlodinow most noticeably leaves out contributions from the ancient Indians and Chinese, and only briefly mentions the Arabs- basically taking a very Europe- and American-centric point of view...take it or leave it, but I can't help but agree that these are the people that took us from the parallel postulate to quarks, gravitons, and so on. Historical context is cherry-picked to support the anti-Christian and anti-antisemite (basically pro-Jewish) opinions of the author, which isn't to say the points aren't valid. As you will discover in reading the book, Christianity killed (literally) the ancient Greek science, and has impeded the return of logical thought and science ever since. So we don't have complete historic rigor here- I say who cares. Mlodinow has written a story with few geometric sketches and even fewer equations, not a textbook. If you want the usual dry history of "and on April 12, 1652, Hermann von German discovered this phenomena while rowing a boat across a lake," or page after page of equations, then I'm sure there are many other books out there to satisfy your needs. So, take the finer points with a grain of salt (if it sounds too good to be true, it probably is- except for C.F. Gauss) and enjoy the ride of learning about the people behind the math and physics. 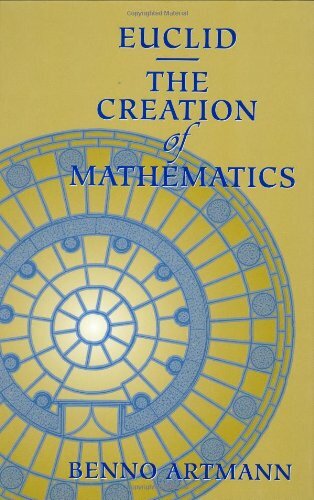 This is still a great book that I would recommend to those interested in math and/or physics. If writing around 1632 Galileo was right that the book of nature is written mathematics then Leonard Mlodinow's book is a kind of Cliff's Notes version. Mlodinow is a highly experienced writer who collaborated with Oxford's Stephen Hawking when they wrote A Briefer History of Time and his understanding of the material as well as his ability to write accessibly both abound in this work which traces mathematics from the time of Euclid to its present place of prominence on the frontlines of string theory. Along the way, Mlodinow gives biographies of some of the critical figures like Euclid himself, Descartes, Gauss, Einstein and finally Ed Witten...interestingly enough who works out of the same Institute for Advanced Study that Einstein worked out of in the years prior to his demise. 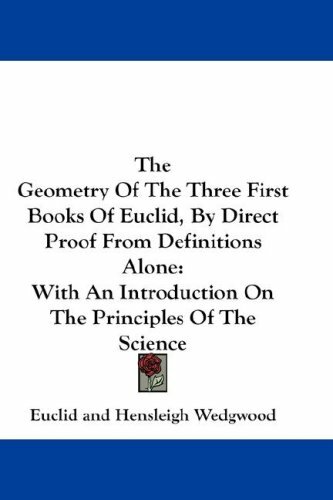 What makes the study so fascinating is that it tracks a body of study...mathematics...which endeavors to describe reality.In the beginning the story started with Euclid and his fifth postulate...the assertion that parallel lines don't meet. While it's true that Euclid's postulate produced a self consistent mathematical system, it's also true that eventually (and by eventually I mean like over two thousand years later) it was discovered that you can create yet another self consistent mathematical system which says that parallel lines do meet. In other words, Euclid created a ruler which is great for measuring flat spaces but later mathematicians in collaborative effort created a special bendable ruler which can measure curved spaces...like a ball. The significance of this later discovery was made all too obvious when Albert Einstein asserted that gravity bends space...making it more curved and less flat. So as can be seen the story here is an important one which tells us nothing less than the true emerging story of the universe in which we live and its origins. Euclid's Window - A highly enjoyable walk through the Math Timeline! 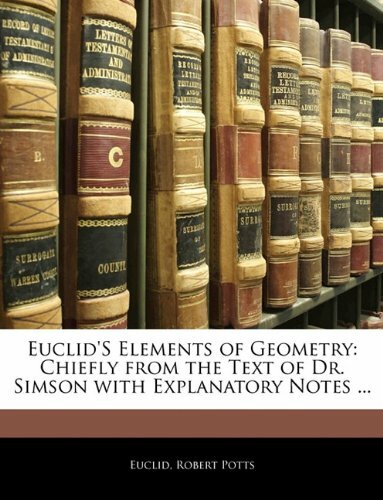 Tracing the formal development of Euclidean geometry, this text closely follows Euclid's classic, Elements. 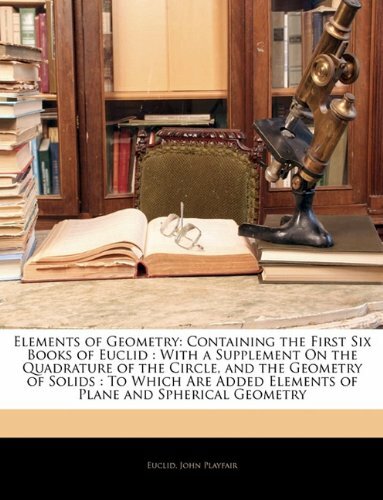 In addition to providing a historical perspective on plane geometry, it covers related topics, including non-neutral Euclidean geometry, circles and regular polygons, projective geometry, symmetries, inversions, knots and links, and informal topology. Includes 1,000 practice problems. Solutions available. 2003 edition. 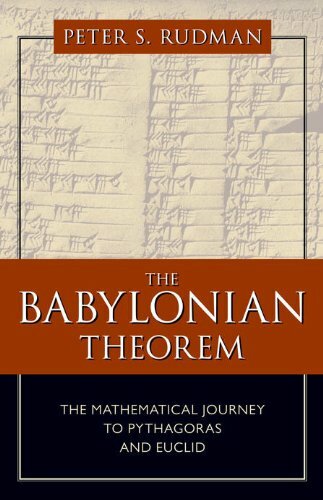 The Babylonian Theorem: The Mathematical Journey to Pythagoras and Euclid offers a fine sequel to HOW MATHEMATICS HAPPENED and comes from a physicist who explores the early history of math and how it was used to solve amazing problems. Illustrations from early Egyptian texts shows how math evolved and presents a 'Babylonian Theorem' which he shows was used to drive the Pythagorean Theorem. College-level math and science collections especially will find this an intriguing math analysis. Get this book only if you love math, algebra, and geometry. //The Babylonian Theorem// is a mind-boggling examination of ancient Babylonian and Egyptian mathematical prowess. Until reading this book, this reviewer mistakenly thought advanced math was mostly a modern invention. Rudman shows us how Old Babylonian and Egyptian scribes avoided nonterminating fractions, though today the electronic calculator makes them less maddening. Rudman includes a generous portion of square root calculations courtesy of Archimedes, the most famous mathematician in ancient history. The chapter on pyramid volume will intrigue anyone interested in how the ancient Egyptians might have attempted to determine the needed material to build pyramids. Rudman delves into Pythagoras' founding of a religious cult with the motto "All is number," or as Rudman interprets it, "All is rational numbers." We learn that Pythagoras and his followers studied patterns that are formed by numbers, which led to number theory. Rudman concludes with a chapter on Euclid, the ancient Greek mathematician who wrote history's most popular textbook. Throughout the book, Rudman posts "Fun Questions" which are mathematical problems for the reader to solve. This is a mathematics book that includes a little history of ancient people and cultures. It's a good read for number lovers. This is a very good idea for a book and perhaps some day someone will do it right.Combining history and mathematics is a wonderful way of teaching students and I really wish that this book had been done right. I have to say that it got off to a fairly good start, with a good description of Egyptian and Babylonian number systems and an explanation for how they might have evolved.Although some of the related equations are not difficult to derive, I think that a quick derivation would have been helpful.I also would not have been able to figure out what a greedy algorithm was from the explanation given if I did not already know it, but these are relatively minor points. The problem comes when the author starts talking about what he calls the Babylonian Theorem mentioned in the title.He claims that the Babylonians knew how to prove the Pythagorean Theorem and he gives as justification a geometric diagram.Now the diagram does geometrically show that (a-b)^2 + 4ab = (a+b)^2, but I have hard time seeing how the Pythagorean Theorem follows, because the diagram contains no right triangles.There is a related diagram that can be used to prove the Pythagorean Theorem, but the author makes no reference to it, and I am not convinced that the Babylonians could have made use of it, because there is some algebraic manipulation required that they might not have been able to handle. Okay, so at the very least the author showed how the Babylonians came up with a way of solving a particular type of quadratic equation.The author then claims to show how this was used to solve problems.He gives the following problem from a Babylonian text: A number subtracted from its inverse is equal to 7.I was guessing that in modern terms this would be: x - 1/x = 7, though neither this or any other interpretation is presented. My interpretation must be incorrect because it is stated that the equation has an integer solution and you can tell by inspection that this will not be true for my equation.There is then shown how the Babylonian student solved the problem and I have no idea how the manipulations relate to the original problem. Later on, it is stated that Euclid proved the Babylonian Theorem using the Pythagorean Theorem.What is shown is a simple way of constructing a right triangle have a hypotenuse of (a+b) and a side of (a-b).Since there is a simple general method of constructing right triangles using straightedge and compass, I am not sure what this particular construction proves. I would strongly suggest that the author do some serious editing of the book, providing explanations.It may yet prove to be useful, but in its present form it is one big mess. 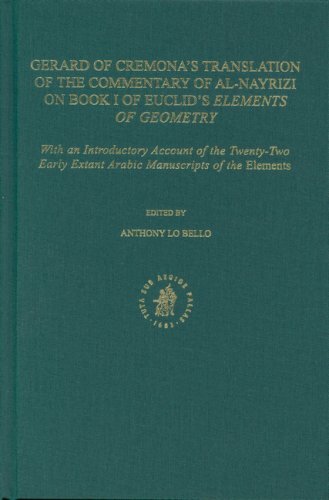 The material in Euclid's Elements may be divided into four categories of very different degrees of interest for modern readers. (a) Elementary material. 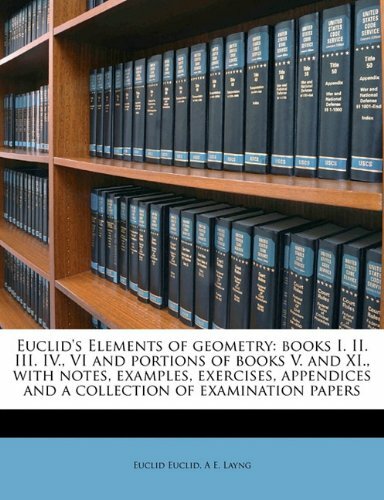 To keep us interested when covering tedious proofs of obvious things Artmann discusses foundational issues (as seen by Euclid and contrasted with the modern view), the principles that guide the overall structure of the books, historical topics, etc. (b) Well-known material. This category includes some basic geometry (Pythagoras's theorem, etc. ), but primarily it includes all of Euclid's number theory. This is very interesting stuff but less exotic than other parts of the Elements since these pearls have been kept polished and accessible (see, for example, the historically enlightened books by Stillwell, esp. 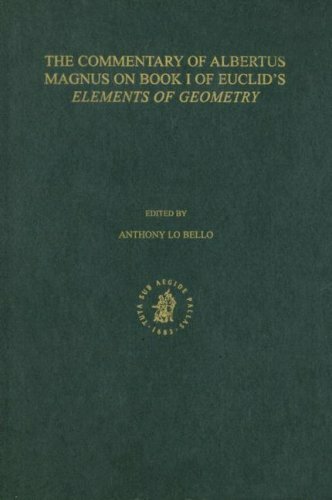 "Elements of Number Theory" and "Numbers and Geometry"). (c) Incomprehensible material. Some parts of the Elements appear mysterious to the modern reader, especially some aspects of "geometric algebra" and of course the theory of incommensurability. A truly faithful guide to the Elements would make it its mission to clarify these things, but Artmann is not that committed, often preferring instead the easy way of looking for agreement with modern mathematical-aestetical principles and commenting on those things instead (e.g. discussions of the role of generalisations and the relation between problems and theories). (d) Constructions. This is the most rewarding part. First there is the remarkable construction of the regular pentagon in book IV. 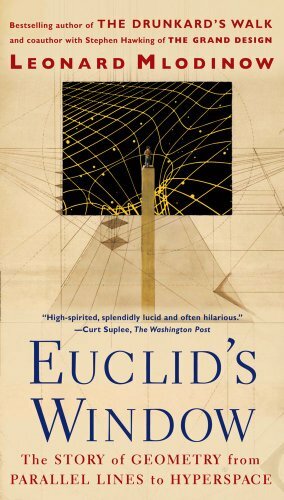 Euclid's construction draws on all previous books, in accordance with his aim to hide his masterplan and unveil it in a flash of brilliance just as we though he was getting lost in a mass of technicalities. Artmann adds helpful commentary on how the principles of construction may be understood through possible earlier constructions that used marked rulers and similar triangles (not developed by Euclid until book VI). The similar triangles proof uses a neat property of the pentagon: a side and a diagonal are in "extreme and mean ratio" (i.e. "golden ratio"), so constructing this ratio is one way to construct the pentagon. 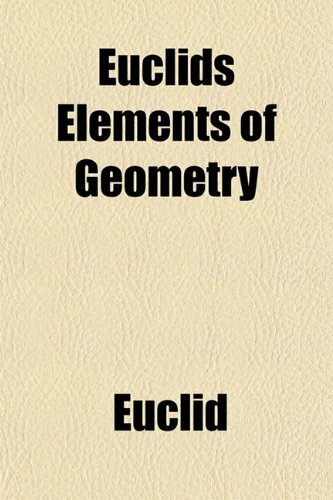 Euclid brings this up in connection with the marvellous constructions of the regular polyhedra in book XIII --- the culmination of the entire Elements. 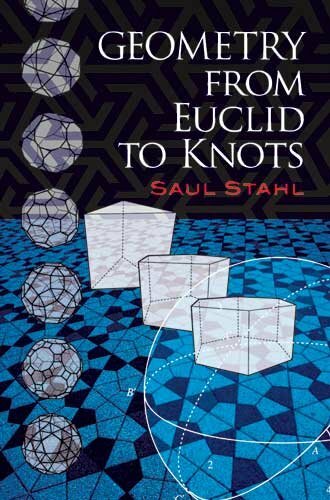 "For the construction of the dodecahedron, Euclid starts with a cube and constructs what can be called a 'roof of a house' over each of its faces". The pentagonal faces of the dodecahedron are made up of a quadrilateral piece of one roof and a triangular gable from the roof on the adjacent side. To make this work we must choose the right length for our beams, i.e. we must divide the side of the cube in extreme and mean ratio. The construction topics are not only the most rewarding in themselves but also the starting points of Artmann's most enthusiastic excursions, including the modern algebraic view of constructions as developed by Gauss, the group theoretical view of symmetries and polyhedra, appearances of these figures in art and architecture, etc. This is a Renaissance book by a Renaissance man.Artmann gives a full summary of the "Elements", using considerable modern notation.It is accurate and detailed, and the various themes he traces (such as Symmetry, or Incommensurables) let him include a wide range of topics: architecture, design, sculpture, myth, history -- even philology and poetry.Some may think he limits himself too narrowly to the classical Greeks, does too little digging in the Babylonian or Egyptian parts of the story. To Artmann's credit, his book disregards the smallscale disputes amongst superspecialists ("all modern translations of Elements are satisfactory").He overturns the fashionable idea that the "Two Cultures" cannot communicate.So, Rilke has something to say -- perhaps not to Hilbert, but to the widely cultured mathematician, or to the general reader -- about Contradiction, or Widerspruch. About the pre-Euclidean origins of mathematics in Greece, he overmodestly disclaims specialist knowledge.An example:he traces the earliest technical work on the dodecahedron and the icosahedron via pre-Euclideans such as Theaetetus (Plato's friend), and up to the highly abstract Group Theory work on isomorphisms of the 1990s A.D. -- and does this well and surefootedly. 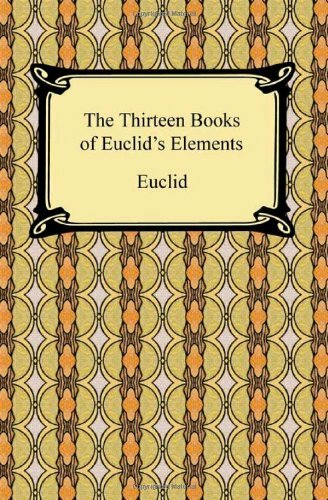 Too bad his modesty barred him ("I leave that to the specialists") from analyzing the pre-history of Euclid's Book XII, the classical ancestor of our integral calculus.The fact is that he knows a great deal about Eudoxus (another friend of Plato's).Perhaps more detail in a Second Edition? His work on the so-called Euclidean Algorithm (finding a greatest common factor) is another valuable contribution.Its autobiographical flavor is reminiscent of Archimedes in "Sand Reckoner".It allows him to stake out a clear and non-partisan position on the "where is the algebra?" question, on which scholarly debates often produce more heat than light. So multi-faceted a book, one could wish an Index fuller than a mere 2 pages.Typos are too frequent for a good house like Springer, including two I found in names of authors or book titles.But the book's cultural sweep is admirable throughout, its bibliography good. TL Heath's 1933 report about the Cambridge undergraduate, so struck by Euclid ("a book to be read in bed or on a holiday") may have been exaggerated, making him over into a Young Werther.But Artmann's charming and learned book really is hard to put down, on or off holiday. This is a Renaissance book by a Renaissance man.Artmann gives a full summary of the "Elements", using considerable modern notation.It is accurate and detailed, and the various themes he traces (such as Symmetry, or Incommensurables) let him include a wide range of topics: architecture, design, sculpture, myth, history -- even philology and poetry. 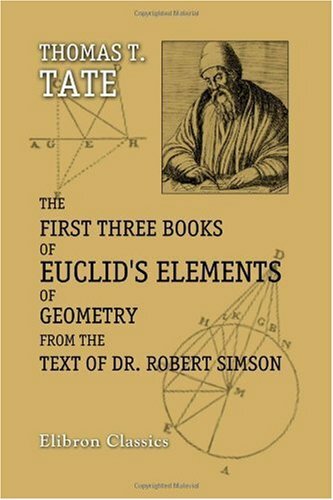 About the pre-Euclidean origins of mathematics, he overmodestly disclaims specialist knowledge.An example:his tracing of the earliest technical work on dodecahedrons and icosahedrons via pre-Euclideans such as Theaetetus (Plato's friend), and on up to the Group Theory work on isomorphisms of the 1990s A.D. is done well and surefootedly. 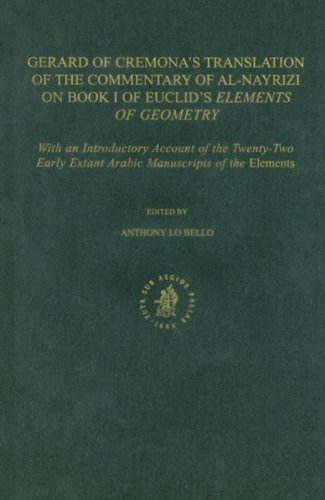 Too bad his modesty barred him ("I leave that to the specialists") from analyzing the pre-history of Euclid's Book XII, the classical ancestor of our integral calculus.The fact is that he knows a great deal about Eudoxus (another friend of Plato's).Perhaps more detail in a Second Edition? His work on the so-called Euclidean Algorithm (finding a greatest common factor) also contributes importantly.Its autobiographical flavor is reminiscent of that of Archimedes' in "Sand Reckoner".It allows him to stake out a clear and non-partisan position on the question "where is the algebra?" question, on which scholarly debates often produce more heat than light. 12. 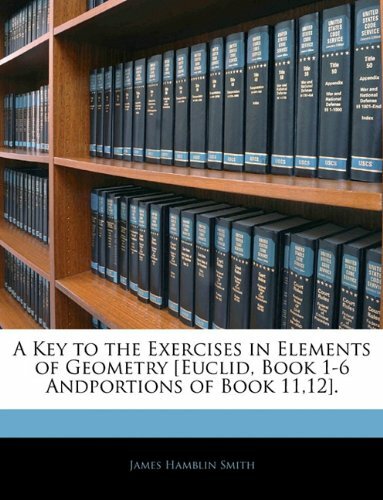 A Key to the Exercises in Elements of Geometry [Euclid, Book 1-6 Andportions of Book 11,12].